Apr - 28 | By: HDFEST | no comments. 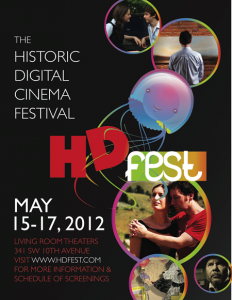 HDFEST returns to Portland May 15th-17th for three nights of screenings of independent films at the Living Room Theaters from 5pm-11pm. Indie filmmakers will be in town to discuss their work in Q&A sessions after the screenings. The festival also includes various works by local Portland filmmakers including Light of Mine, Sub Rosa, The House Always Wins and Amy Alyson Fans. Please visit http://www.hdfest.com/hdfestportland.html for more information. Tickets are $9 and can be purchased at the Living Room Theaters box office and website.